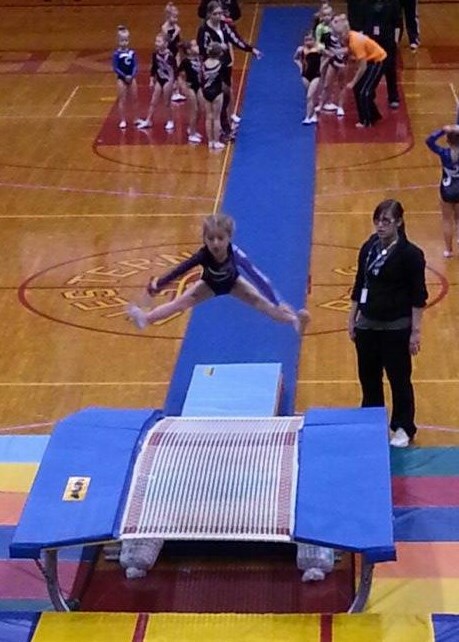 Mileys’ Gymnastic Meet…Yea….She Won 2 Tophys and a Medal – …………. ''AND LET THE FUN BEGIN''…………….. This weather is soooooooo so cold. We didn’t plan on this. It is 19 degrees right now and going down to 12 tonight. This feels like the middle of January. Even in Harlingen Texas, it is 48. I bet those snowbirds are freezing. lol. Here it is Monday evening and where leaving Sunday. 6 days and counting. Almost here…..Yea……Gotta pack the winter coats even for Texas….brrrrrrrrr….. This weekend we went to a Gymnastics meet for Miley, my 6 year old granddaughter. She is so tiny and cute. Miley has been attending Tumbling for 3 years. Tina entered her in Competition the first year. She has won many medals and trophy’s and has competed in State and in the Nationals. We decided to leave for Rock Island on Saturday. We have friends their that use to live down the street from us. John use to work at Coca Cola with Rich. John transferred back the Quad Cities were he was from, 2 years ago. They became good friends of our family while they lived here. The Meet was just a half a block from John and Jessie’s. Tina decided that her and Miley and Austin would stay with John and Jessie, and we parked the Motorhome at the high school where the meet was to take place the next day. Cameron came with us also. You’ll never believe what happened. It snowed 2″…..HOW HORRIBLE….Its suppose to wait till we leave. We decided to go out to eat. Rock Island is built on a hill. Fortunately they live on the high side. We headed down the street, and the cars coming up were at a stand still. Well they tried,….lol…….They kept slipping sideways….slipping right into the curbs…….lol….Out came the wreckers…..the fire trucks…..What a mess. We ate at a Mexican Rest. and then came home. Fortunately by the time we went back up the hill, the salt trucks were out. Easy trip back home. The next morning , breakfast at Johns and on to the meet at the high school…..
You will love to have these pictures to look at while you are in Texas. Travel safe and let us know when you arrive. We will be leaving after Thanksgiving and wish we were on the road now.